It’s to protect your fimgers. Photo courtesy of Marika Claus. Found at skating rink ticket machine in Japan. A robin stole my gloves. What, no tentacle gloves allowed? The people who skate are slaves?? 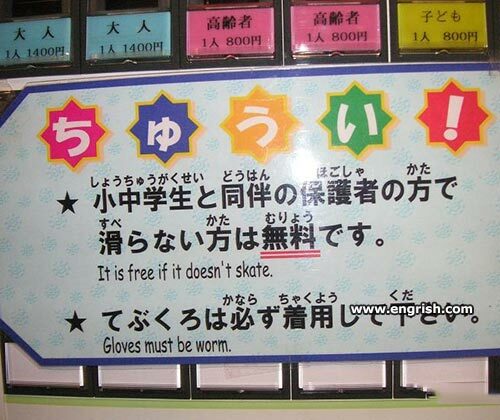 It doesn’t skate for free or else it gets the worm again. I was borm this way. Did anybody ever try to persuade gloves to be a worm? I wore worm gloves, trojan socks and a spyware hat. I caught a virus. And gloves must be WARM. Keep your grubby hands off my skates! For other uses, see Worm (disambiguation). If it doesn’t skate we’ll let it slide. I am looking for groves. Worm gloves are for birds to wear on their pinions. There isn’t enough lava soap anywhere to clean those gloves. This sign doesn’t skate. I think I’ll take it. Photo courtesy of Maria Claus? @Classic Steve: Good thinking! Remember to wear gloves. “Mit uns.” Said the Fraulein. By the way. What if “it”. And does “it” normally skate.